Oh January …! The month known for all kinds of resolutions. For a while mine was to drink those 8 glasses of water, and also to meditate. You see, I grew up with a Dad who started his meditation practice in the 70’s, and I can unbiasedly say he embodies a chillness level that’s pretty much out of this world. So as much as I’ve admired how calm he is, I haven’t been able (yet) to sit twice a day for 20 minutes, and get my omm on. My gorgeous mom and I share a bit of a triple A type personality, and at the end of those 20 minutes, I’m making all types of To-do lists in my head. So after years of focusing on the same resolutions, I’m sticking with the 2 things that come natural to me. Working out and healthy eating. The two go hand in hand.. and if you think that one without the other could thrive, well think again. They can’t. You can run 10 km a few times a week, go to hot yoga, leave your spinning bike sweaty, or spend an hour in the gym everyday, if you go back home to processed foods, you won’t see results, but most importantly it’s a step back if you want to achieve good health. Now, having said that, balance is key. At home, Fridays usually mean Pizza night, and there’s the once a month craving where the girls and I would be in bed watching a show and Gaby and I will ask Isabella to go to the grocery store and get us a pint of Ben and Jerry’s and that’s ok. (3 spoons and our friend chocolate fudge brownie?? Um…. yes please!) As long as the rest of the time we eat well, and workout. Crossfit all the way for me. For years, I’ve followed a plant based diet, but eat fish two times a week. I have to say I feel the best when my meals are made with whole grains and lots of fresh vegetables. Add a few nuts and and a spiced dressing and you’ve got yourself a meal you could eat for lunch or dinner. 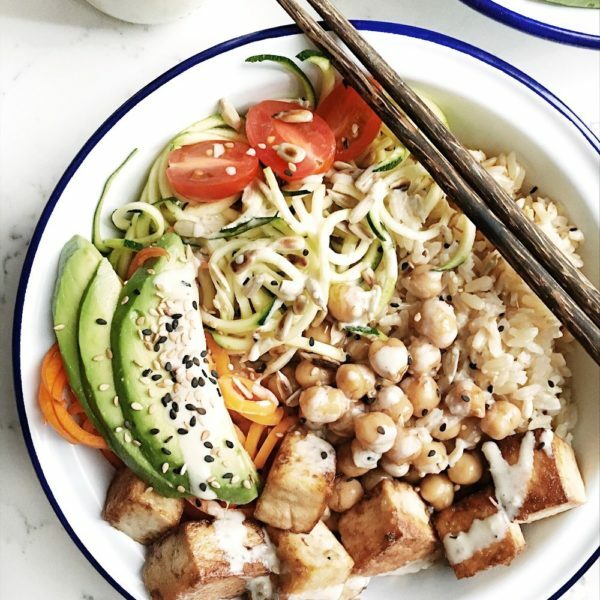 Meals like this Buddha bowl make life easier. Pack it in a mason jar and you can bring it to work! 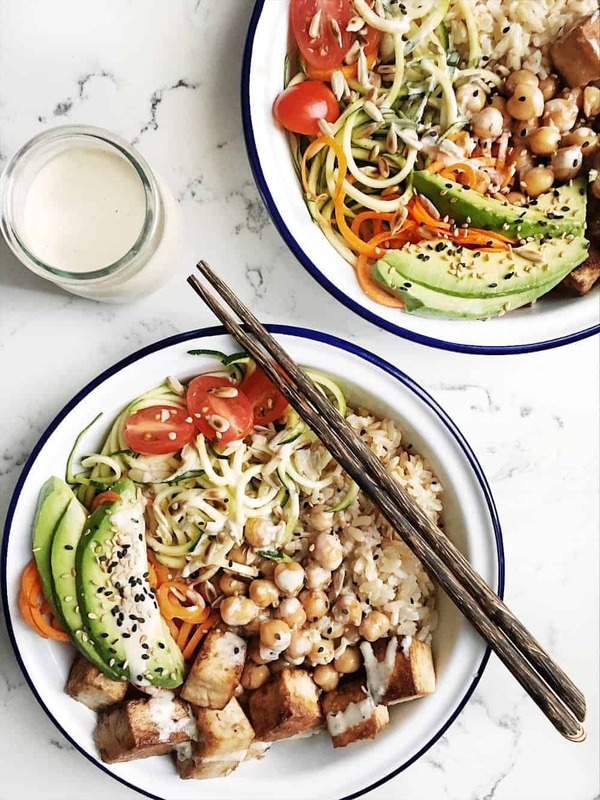 For this recipe, feel free to use quinoa, farro or brown rice as your base and if tofu is not your thing, make your own variation using, shrimp, salmon or chicken. If you don’t have a spiralizer, cut the veggies in cubes. I hope that the start of your year is filled with health. Truly what matters the most! Wrap the block of tofu in a kitchen towel and place 2 cans from your pantry on top of it. This step will get rid of the tofu’s moisture and the cubes will brown better. Cook rice according to package directions. With brown rice I find different brands offer different cooking times. 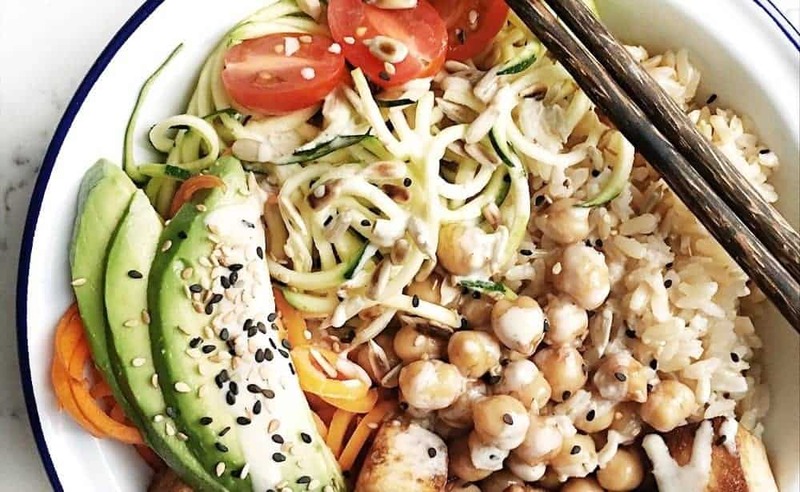 While the rice cooks, cut the carrot and zucchini in cubes or use a spiralizer if you have one, and set aside. Cut the cherry tomatoes in half. In small bowl, mix the chickpeas with olive oil, lemon juice and salt & pepper to taste. 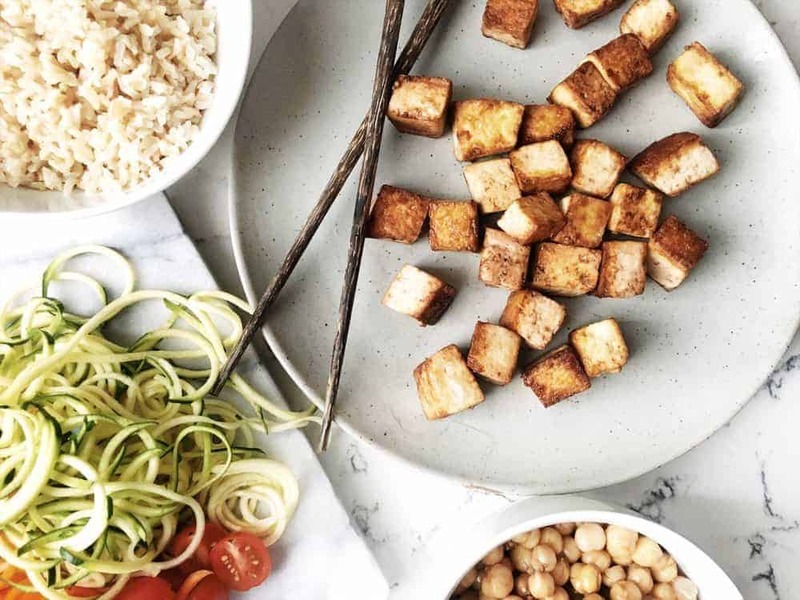 Cut the tofu in small cubes and place in a bowl. Add the sesame oil and soy sauce and marinate for 10 minutes, then sprinkle the cornstarch and mix until the cubes are well covered. Place the coconut oil in a frying pan and wait until is all melted and hot. Add the tofu cubes and wait until they brown before turning onto another side, usually 2 to 3 minutes. When ready, place them on a plate lined with paper towels. 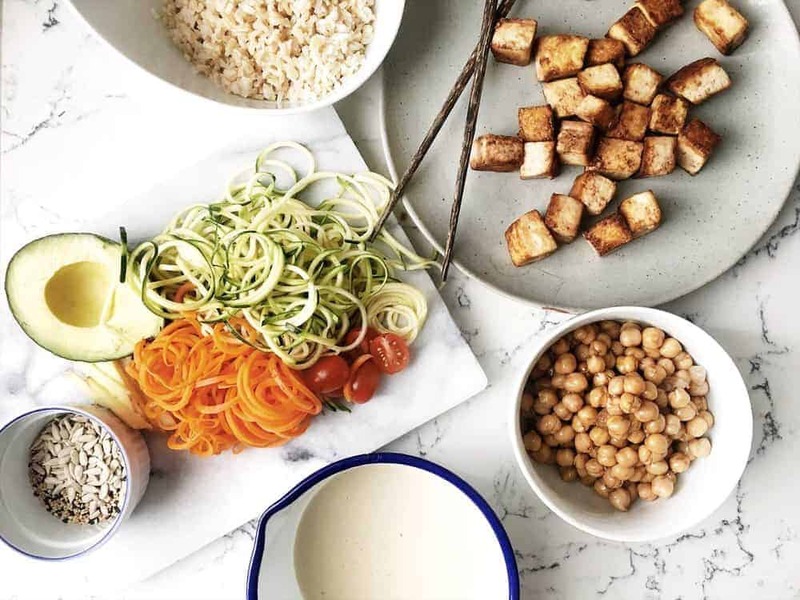 In a medium bowl, whisk all the ingredients for the tahini sauce until the mixture is smooth. 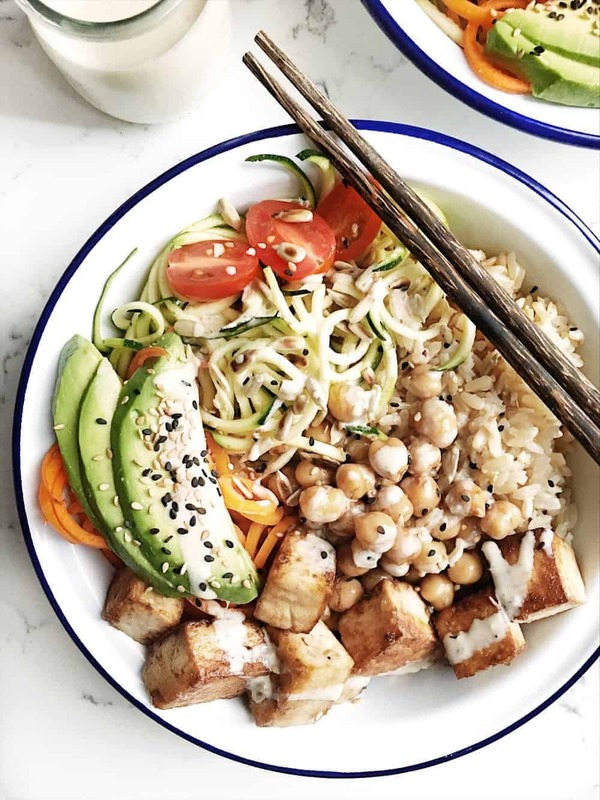 Arrange two bowls with the rice, zucchini, carrots, chickpeas, tomatoes, tofu and avocado, top with sesame and sunflower seeds + tahini sauce. Previous Article Previous post: Pomegranate and Prosecco frozen cocktail.